Optimizely provides the foundation for Evans Cycles to make informed, data-driven decisions, transforming their online business, and increasing revenue. Started in 1921, Evans Cycles is the UK’s largest multichannel cycle retailer with over 60 stores throughout the UK and a website with 1.5 million monthly unique visitors, delivering to hundreds of countries worldwide. Using Optimizely as the foundation, Daniel focused first on gaining more insight into user behavior across their website, building momentum around the use of testing and analytics throughout the company. “Optimizely is the cornerstone of building our testing culture,” Daniel says. The ultimate goal was for Evans Cycles to make better, faster decisions based on data and insights, a characteristic of any leading digital business in Daniel’s opinion. With minimal development resources, Daniel used Optimizely to quickly get results that made a meaningful impact. He learned by first listening to their customers, and based on user feedback, he developed assumptions. He then used Optimizely to test each hypothesis. Optimizely integrates seamlessly with the company’s other user testing platforms and thus allowed them to uncover how the opinions of customers in user research impacted the millions of users across their site. In the end, this gave Evans Cycles the data they needed to guide decision-making and their website roadmap. Based on customer feedback, Lee decided to run a test on their product page. 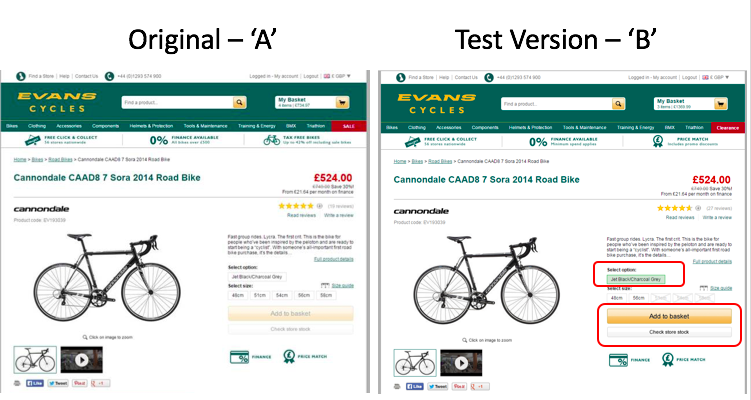 Most online cycle vendors follow the same approach on their product pages – product image, description, and selection area that leads you to add to basket and then finally to checkout – and Evans Cycles was no exception. During user research, Lee and team received feedback from customers that they were trying to buy a bike but it looked out-of-stock, despite the fact that there was plenty of stock available. They hypothesized that this could be based on the greyed-out add to basket button before the user has made a selection. They tested a version of the product page that made the add to basket button more visible and prompted the user to make a size and color selection. This simple change made a big impact on the product pages, showing a 49% uplift in add to basket metric and 4.3% more revenue generated. The original experience didn’t show whether or not bicycles were in stock at physical stores; the variation added this information for visitors. With minimal investment, Evans Cycles has seen great success and significantly improved their online experience using Optimizely. “Optimizely has changed the way that Evans Cycles does business,” according to Daniel. The company is now equipped to take quick action, based on the real-time data coming out of their testing program, and they have much greater insight into user behavior across their website. The company is increasingly focused on analytics and Daniel has developed an A/B testing roadmap with plans to continue ramping up their testing efforts moving forward.